BMW has a rich automotive racing history. What many don't associate BMW with is their success in motorcycle racing. In 1969 BMW introduced the R75/5 boxer to the US as their sportiest bike of the moment. Unfortunately it wasn't considered very sporty compared to the Italian and Japanese bikes they began to desire. The BMW US importers, Butler & Smith, under the leadership of Dr. Peter Adams, decided they were going to change that staid image by creating a 5-year racing program. The parts manager for Butler & Smith, Udo Gietl, was a part-time motorcycle racer and former NASA engineer. He was given the task of developing a race bike based on the R75/5 for the 1972 Formula 750 class of the AMA National Championship. Initially, they didn't fare that well, managing a 13th place. 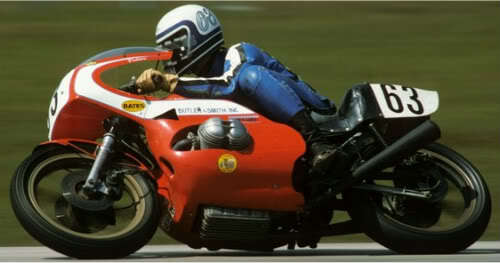 Helmut Kern, general manager of Butler & Smith's west coast operations, determined that Gietl's bikes would be a great fit for the Production class (which eventually evolved into the Superbike class). Reg Pridmore, riding one of the two bikes prepared in 1972 would campaign the bike to an incredible 15 wins and 6 second-places out of 23 races. By 1973 Geitl was able to extract 92 HP at 9500 rpm from the push rod boxer. That was more horsepower than the chassis could handle. The combination of the weak frame and poor steering led to a disappointing 1973 season. In addition to starting with a better and lighter chassis for 1974, Gietl managed a claimed 98 horsepower at 10500rpm from the flat twin 750cc engine. That, combined with a very competitive dry weight of 309 pounds, gave the F750 good acceleration and a top speed of 165mph on the Daytona bankings. The 'stuffy' BMW was providing serious competition to the 2-stroke triples and fours. While Butler & Smith were hitting their stride in Formula 750 with Pridmore, BMW was releasing the R90S Sport Bike. Butler & Smith campaigned the new bike R90S in the Production Series to great success. That success started and evolved with this bike. While this isn't video of the Butler & Smith model, this is a sense of the experience.